Tirol in summer is Austria as you imagine it to be: a lush green region of lakes and rivers, craggy mountains, rolling meadows and pretty villages. Tirol is in western Austria and is a popular ski destination. It’s a great place to visit in the warmer months too: my 11 year-old son and I spent a lovely few days there in August. 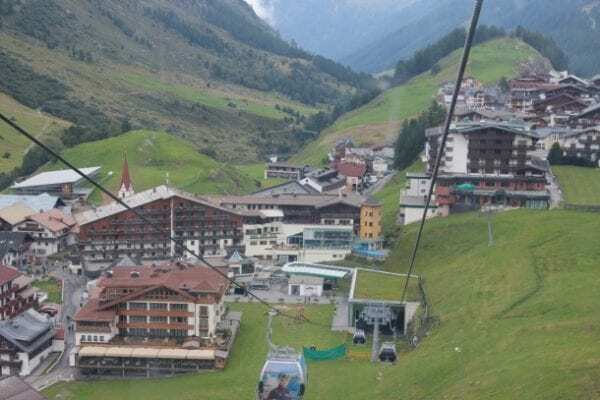 We stayed in the beautiful Ötztal valley in the pretty village of Obergurgl, one of the highest ski villages in Europe. The best hotel for families there is the Edelweiss & Gurgl which was founded in 1889 and has lovely family rooms, indoor and outdoor pools, a riding school, guided walks and a full programme of activities on offer for kids. Some of the cable cars in the village run all year round and we took one to the Hohe Mut Bahn 2,670 metres up in the mountains. It was chilly at the top but we soon warmed up with hot chocolate on the sun deck of the traditional restaurant there. 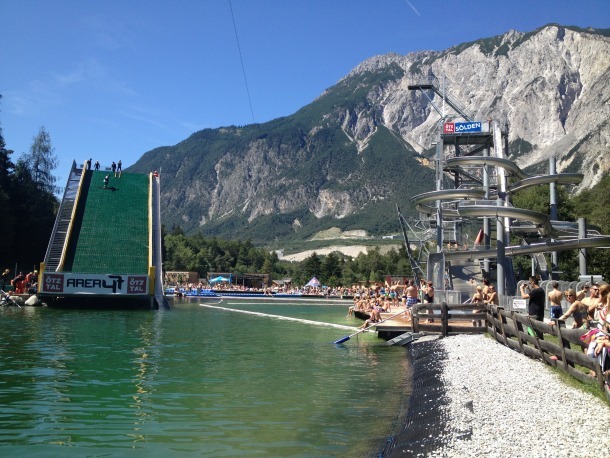 We spent a sunny day at Area 47, an amazing outdoor adventure park in the valley. Area 47 offers all sorts of extreme sports and is geared up for beginners so is a great place to try things out. From the highest high ropes course in Europe to white water rafting to motocross to caving there are all sorts of exciting things to do at the park. You have to be at least 12 years old to take part in most of the activities which meant that my son was slightly too young for most things there. He didn’t mind though: he was fascinated just watching what was going on and he wants us to go back there when he’s older. The Area 47 water park is rated as one of the best in the world by CNN and we had great fun swimming in the lake and whizzing down the slides. You can also stay at Area 47 in basic wooden cabins and teepees and there’s a decent restaurant overlooking the lake. Entrance to Area 47 is free but a one-day ticket to the Water Area costs 21 euros for adults, 13 euros for kids age six -16 years old and kids under six years old are free. Activities outside of the Water Area such as rafting and the high ropes course are charged individually and should be booked in advance. We both really enjoyed our afternoon at Aqua Dome, a luxurious spa, hotel and water park. We had a quick tour of the spa and hotel (the family suites are gorgeous) and then were free to try out the twelve different pools. Some of the pools are inside, some are outside, some are salty, others are not. The temperature of the pools vary but all are filled with the naturally hot mineral water which is piped from deep underground. My favourite was a bowl-shaped, warm, salty, pool outside where I listened to underwater music while floating on my back and looking at the mountain views. It was fun going down the water slide and swimming in the lazy river with my son but not so fun when he dragged me in to the cold pool, his favourite of all. Day tickets for the Aqua Dome pools and spa cost from 25.50 euros per adult, 13.50 euros per child and children under the age of three years old are free. There are reductions for families, students and seniors. In 1991 some hikers discovered the body of a neolithic man frozen in the mountains here. Ötzi, as he became known, was killed by an arrow around 5,000 years ago but when he was found his body was so well-preserved that the pores on his skin were visible. 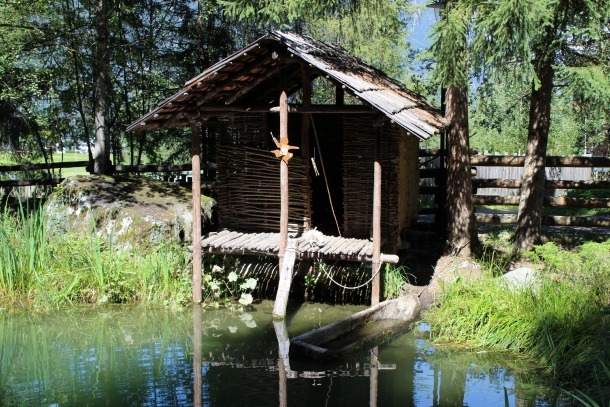 Ötzi-Dorf is a reconstructed Stone Age village and open-air interactive museum where visitors can learn about Ötzi and his way of life. A whole range of objects were discovered with Ötzi including clothes, tools, weapons and his backpack and at the village you can learn about how these would have been used. There are also various ancient breeds of farm animals there such as woolly pigs and Soay sheep. We enjoyed our guided tour of the village in English (there’s no charge for this but you need to book this in advance). My son’s favourite part was seeing how Ötzi would have made fire using pyrite, flint, moss and wool. Entrance to Ötzi Dorf costs 6.80 euros per adult, 3.30 euros per six -15 year-old, under-6s are free. The Ötztal valley is high up (Obergurgl where we stayed has an altitude of 1,930m) so even if you go there in summer you need to be prepared for the possibility of cold weather, especially if you’re going up into the mountains. My son really enjoyed the food on offer, especially dishes like curry würst (a long sausage with curry sauce) and schnitzel (a thin slice of meat fried in breadcrumbs). I don’t eat meat so had less choice than he did but we both liked the traditional puddings such as pancakes and apple strudel. The best airport for Tirol is Innsbruck. We flew from London Gatwick to Innsbruck with Thomson. I think that pilots must love landing at Innsbruck airport as the approach is so dramatic and beautiful. Planes fly along a deep mountain valley past pretty villages as they come in to land. 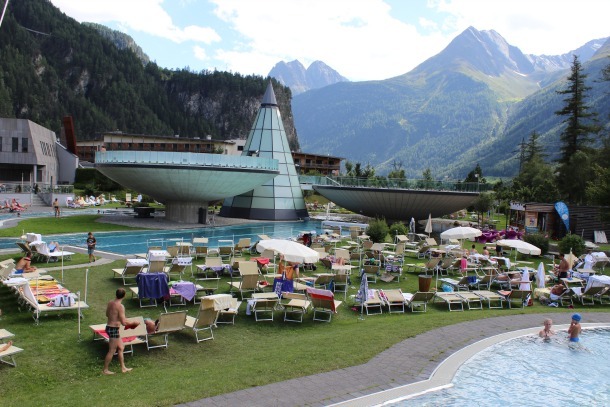 Thomson Lakes and Mountains has seven nights at the 4-star Hotel Edelweiss & Gurgl in Obergurgl, with half board prices starting from £961 per adult (free child prices on selected dates) including return flights from London Gatwick to Innsbruck and resort transfers. Regional flights are available from Bristol (+£69), Birmingham (+£49), Manchester (+£49), Leeds-Bradford (+£59) and Edinburgh (+£59). For more information about the Ötztal valley and the rest of the Tirol visit the official Tirol website.